Here it is (the original email). You have to do it several times to completely remove the stones. Just be warned that removing your gallbladder will leave you susceptible to Diabetes, Heart diseases etc. My motto don't do anything that you can't reverse! Please let me know your experience if do it. Thanks. NB: Have also included the link to the Hulda Clark method. I have done both methods and prefer the Clark method as it is it faster and does not have the potential to raise blood sugar levels. Thought this enjoyable method maybe used to do liver cleanse prior to using Beck’s and H.Clarks zappers. This fail-safe method of removing gallstones worked for me! And I now have a green gallstone preserved as proof. It's so simple that surgery seems criminal, especially considering you may be minus a gallbladder! Another fine example of hacking from allopathic medicine! Talk about primitive or what! Talk about a rip-off, according to the ref. cited, a number of doctors know about this but still don’t use it. Who are the quacks here? Disgusting! Drink daily (one litre per day with or without meals - any way you like) fresh apple juice (I used organic apple juice). This will soften the stones to such an extent that you can squash them with your fingers. On the 6th day, skip dinner. At 9 PM take 1 or 2 tablespoons of Epsom salt dissolved in 1-3 tablespoons of warm water. At 10 PM shake together half-cup (4 Oz) unrefined, cold pressed olive oil and 2 oz lemon juice and drink. Immediately go to bed and lie on your right side with your right knee drawn up toward your chin. Remain in this position for 30 minutes before going to sleep, to help olive oil drain. Another Epson salt solution may be needed during the night, so prepare before going to bed. Next morning you will pass green stones as large as your thumb without feeling a thing. In my case they where about the size of a pea. At first I thought nothing had happened as the stool was mostly water and I did not observe anything, just yellow (bile?) oily stuff. And I thought the procedure did not work. Needless to say I was very disappointed. However, I had to go again and this time it was still very watery but less yellow and I saw some lumps floating here and there. At first I thought it was some particulate matter and almost ignored it since from my first experience I was not expecting the method had worked - but was curious to see what the lumps were, so fished one out and low and behold, after rinsing, it was a green stone! Must have been at least a dozen or so and probably there were many the first time hidden below the yellow liquid. WOW now I am believer. Also seem to have more energy a nice unexpected side benefit! It's so easy and enjoyable to do - think will make it an annual event. Should keep the liver tiptop especially the energy benefit. So far I have done this four time. My last time included red stones. For some it can take 10 to 20 time before a change in stone type is observed. What disturbs me is that people will simply assume that this natural approach is the gospel and that there is some kind of conspiracy in Western medicine. Whenever you look into such a treatment type it into Google and add "truth". In this case, you will discover that the ingredients you are ingesting actually create those little stones you are passing. They are not gallstones. In fact this sort of dramatic treatment can be harmful and result in emergency surgery from having a real stone lodge in your bile duct. If western medicine is so great why bother with alternatives???? "A Bizarre phenomena haunts the practitioner of Natural Therapeutics, it is that patients willingly accept the huge physical risks associated with Medical Care. Yet that same patient and their family has no tolerance for any risk associated with Natural Therapeutics. A one or two percent death rate just from the use of anesthesia is completely acceptable, the death of 40,000 people a year from prescribed medication reactions is acceptable, the death of 40,000 people a year from surgery is acceptable, the death of several thousand people a year from improperly administered or incorrect medications is acceptable, the hospitalizing of over 8 million people in 1994 for drug related mortality and morbidity is tolerated, but not one death or injury from Natural Therapeutics is tolerated." Fantastic! Thanks for the feedback. Make sure you do a few more and make it a annual routine. How do I accomplish the parasite clease? Please let me know how I could get rid of gallstone/kidney. I read only comments from people how happy they are, but could not find the method. Thank you very much for sending me the method. Australia; the other end of the Earth really! Anyone else out there have such a large stone? and was it painful to flush out? I really want to do a flush but am very scared. i have been told to have a gall bladder removal as i have a stone blocking my bile duct. 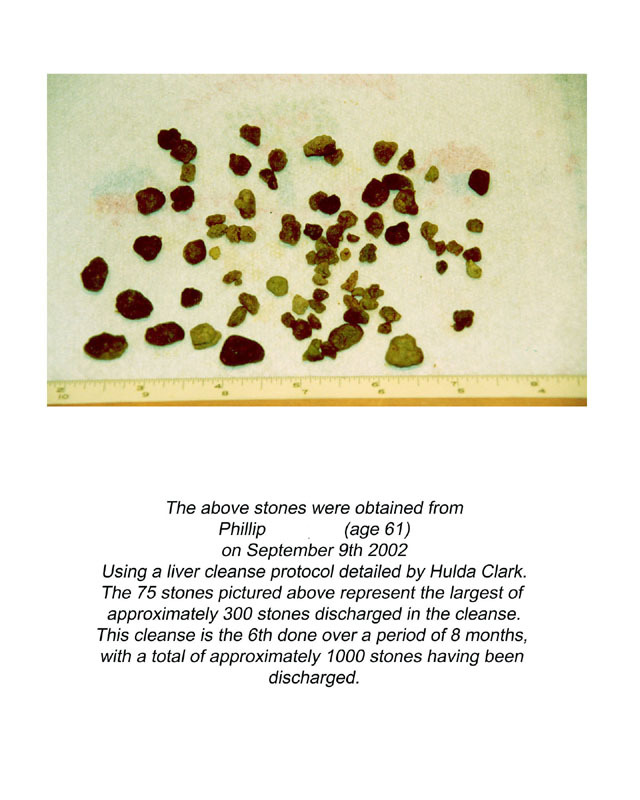 i have been reading about the gall stone cleanse and wondered if it would be recommended for me. Mandi, see my April 8th response above. Like many others, my gallstone is large - 2.5cm diameter. The common bile duct is only 3cm diameter. So a gall flush poses serious potential risks. So far, there seems to be little practical alternative but to have surgical removal of the gallbladder. Do you have have better, practical and workable solutions please? I am one of those who wanted to try the flush, but I am also diagnosed to have fatty liver. I have read one of the comments but you did not answer, so may I ask it again. Is epsom salt safe for those with fatty liverdisease? You can pass fairly large gall stones with no pain whatsoever doing a four-day apple juice cleanse (do the olive oil and lemon on the third night). I imagine for extremely large gallstones you might want to stretch it out to five days or a week (doing it on the 4th, 5th or 6th day). You may also want to investigate getting something that helps to dissolve or break up gallstones. I passed some the size of the end of my thumb with no pain. I did the Dr. Clark Recommended Gallstone Flush after I used my TENS unit as a parasite zapper and observed some very small short thin white worms in my excrement. The Epsom salts taste real bad, kind of sickening. But the 4 oz. of olive oil with the juice of 2 grapefruits tasted surprisingly OK. I did it just as recommended and after a hour of lying down. I could feel the stones popping out of my liver. The next morning in 5 different watery bowel movements over 200 green stones passed out ranging from 2mm to 4 mm and one was 10 mm. There was no pain at all, but within 20 minutes of taking the first epsom salt drink I felt what I describe as a cold feeling of minor cramping in my liver. It iwas not painful, but just felt like your hand might feel when you make a fist. The next day I felt fine. I am 43 and I plan to do it in 2 more weeks. It was completely successful and the only bad of it is getting down the Epsom salts. The stones were softened by the treatment, they can easily be crushed with your rubber gloved fingers. I actually feel very good and would recommend the Dr. Clark method to any one. I actually upchoked a little of the mixture before I went ot sleep then on came the bowel extreme pain and then to the restroom i go. I have been diagnosed that I have 14mm gallstone, but so far I do not feel anything. But I would like to flush that stone. Do you think the recipe can apply to me 170cm high as Indonesian person? Anyone interested in doing a flush should see the info at curezone.com. I have just completed my 2nd flush using malic acid (the key ingredient in the apple juice) for a week and then the Clark recipe, and I passed stones larger than 10 mm (one was 20mm long) without any pain. My doctors recommended gall bladder removal surgery and I thought that should not be the first option. So far, so good. Hi - I did the gallstone cleanse last night and altho I wasnt rigid with the stop eating plan about 4 hours prior to the commencing - I still got about 100 stones out. I also wasnt too rigid in the ingredients as I just bought a 2 litre bottle of clear no sugar apple juice from the supermarket - I dissolved the epsom salts in a tiny bit of warm water and then filled it with about 4 cups of apple juice and put it in the fridge. Apart from a slightly bitter taste - the apple juice managed to hide most of the horrible taste of epsom salts. I also used grapefruit juice as opposed to lemon juice and I was suprised that it didnt taste as bad as I thought it would - its suprising how the grapefruit cuts up the olive oil and turns it into liquid. The only downside of the whole process is the watery bowels and running to the toilet - I stopped counting the stones after the first 3 eliminations. 2 were approx 25mm long and the others were pea size and smaller. I plan to try this process again maybe within 3 - 5 weeks. My wife has 10mm gallstone. I do not know what to do. Please tell me the recepie of Liver cleanse and gallstone removal. Please advise best and safe method. Hi! i just want to ask more info about getting rid of my two gall stone without having a expensive surgery. i really need your advice and instruction to remove my gall stone without any surgery cost... thanks hope to hear from asap..can u add the recipe and instrution how to take it off? thanks again>.. I see that some have questions about the size of the stones. It will not matter because they will be softened if you follow the Dr. Clark protocol correctly. Another extremely important issue is that you should follow the three step protocol of hers if you do not want to get EXTREMELY ill. Only doing the liver cleanse is NOT a good idea. Buy Dr. Clarks book "Cure of All Diseases" and follow the protocol rigidly. You have to kill all parasites and cleanse the kindneys before doing the liver cleanse. There is seen 95 year olds following the protocol with great success, so go on get started right away. And if you get over that low-life "Quackbuster" Stephen Barrett telling you that Hulda Clark is a threat against mother earth, please feel free to ask him shut up and either go out shopping or something with his all his medical industry sponsored money. I had my gallbladder removedabout 5 years ago, can I still do a liver cleanse. You have wonderful collection of articles. I am very impressed with your point of views and broad expertise. I was just wandering if you know if regular use of raw apple vinegar has the same effect on gallstones as apple juice. My understanding is that the malic acid is the one doing the trick. Maya, it is not safe to drink such quantities of vinegar. After I read your simplified procedure and articles, I did my first flush last weekend and passed about 200 stones, without any pain, illness or nausea. I followed the Dr. Clark's procedure, however, since I have problem following recipes to the last detail, I tripled the Epsom salt prior to drinking the oil, which gave me painful cramps, and symptoms like low blood pressure for an hour, after that I was fine. Drinking of the oil was a good experience compare to the 5 days of 1L of apple juice. I am not a juice drinker (I like only carrot juice) and I don't think I am going to do the apple juice routine again. About 6 years ago, I was diagnosed with gallstones. Since they were seen by ultrasound, I assume they were not cholesterol ones, but all stones I have passed were cholesterol ones and so soft. I have been taken two teaspoons of raw apple cider vinegar every morning for the past few years and I believe that is the reason why my pain has disappeared in those years. I also did one coffee and one salt & backing soda enema after that, and highly recommend it to everyone. I cleaned more and bigger stones that way. I felt this week my body started to function better and I don't feel as tired as before. I could not wait two weeks and did another flush today, without the apple juice. I got about 200 green stones this time, first they were all tan color. There will be many more flushes ahead of me, and I am planning to experiment with the raw apple cider vinegar and will let you know how it goes. Thank God, I did not remove my bladder, as the doctor advised me. Where are people getting their info?? Common duct size is normally 4mm at the greatest. Anything greater than 1cm is usually due to obstruction and dilatation. So, to think you can safely pass a 2cm stone is rediculous. I had a patient insist on doing this so I agreed to be a concerned watchful doctor and she brough in her "stones" with a big grin and an "I told you so look". I looked at her so called stone and said that looks like balled up poop and sure enough the pathologist confirmed this. She had her surgery a month later and has felt well since. If anyone has some real confirmed data on this pass it along please. Not just anectote but real path report and ultrasound report. I was one of the unfortunate ones to discover alternative medicines a little late. I had my gallbladder removed after having severe attacks. one during my tri-mester of pregnancy where they thought they would have to take my child early.) What are some suggestions for better health other than the norm of a low fat diet and enzymes for better digestion? Me too! Had GB surgery in 1990 and am wondering if there is a therapy to help my body since there is no bile storage any more....? I have a gall stone of 20 mm diameter in my gall bladder for the last 15 years,when it was diagnosed first. till date I have not faced any problem and I am living my normal life.I have worries that it may effect my liver more over since it is in my knowledge I had to take care of my deit and daily routine.I have gone through your article and recipe for removal of the gallstone. In fact I am very much impressed.Is it safe to go with your therapy for the removal of such a big stone?A line of suggestion will provide me strength and sufficient will power to go for therapy. I am carrying gall stones, thebiggest one of 12 mm for the last 14 years ,when I was diogonised for obstructive Jaundice. Since then, I do not have any other trouble other than Flatulance, feeeling of gas filled stomach and severe letahrgy in carrying out daily routine. I still push my self to work and carry on regular living. I am afraid of the cleanising technique for the fear that, while moving out the stones will block the duct making the surgery inevitable. my mother recently had an unltrasound.In the gall bladder a stone size of 12 mm was found.Becoz of the stones she is having gas problems.Can you suggest me what are the ways to remove the stone surgically as well as non surgically. I tried because anyways some time I have to remove my gall bladder so lets try this there is no harm in trying natural ways it is not going to hurt me and so many people have given their experience. Ultimately I get rid of my gall stones painlessly now I feel like telling every body who ever is having gall stone problems. My body is very sensitive (ex. I can take 1/2 pill of painkiller and be out) and it seems to respond to things with less amounts than for other people. CT scan shows one 7mm gallstone in the gb. Any oil or fat right now hurts like mad. I'm scared that this olive oil potion will bring on excrutiating pain but nobody mentions pain.?? If we all have gallstones then I assume normally these other people have pain with any oil, so how does this olive oil not send your body into some kind of shock and lead to an ER visit? I really want to keep my gallbladder and flush stones, but knowing how sensitive my body is to everything else makes me wonder if I can do it without another ER visit. If I do a lot less Olive oil will that help me or if I don't take enough will I just be in pain and not pass stones? Please advise...thanks!